Key Difference: A typeface (also known as font family) is a set of characters that share common design features. A single typeface is represented by a specific weight, style, condensation, width, slant, italicization, ornamentation, and designer or foundry, but not by size. A font, on the other hand is the way a typeface is styled. Hence, there are many different fonts based on a single typeface. The terms “font” and “typeface” have been used interchangeably. Typeface is often incorrectly referred to as font. However, the two terms have distinctly different meanings. The confusion between the two has been brought on by the introduction of computers and the advent of digital typography and desktop publishing. Now, we refer to fonts and typefaces as ‘fonts’. 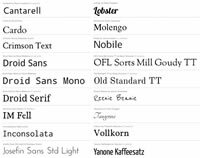 The word “typeface” has actually fallen into disuse by majority of the people. 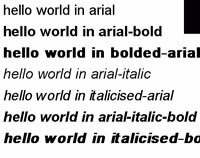 According to Wikipedia, “In typography, a typeface (also known as font family) is a set of characters that share common design features. A single typeface is represented by a specific weight, style, condensation, width, slant, italicization, ornamentation, and designer or foundry, but not by size.” Hence, there are many types of typefaces such as Times New Roman, Arial, Georgia, Bulmer, etc. A font, on the other hand is the way a typeface is styled. Hence, there are many different fonts based on a single typeface. Essentially, font is a variant of a typeface. The difference between the two can be better understood by looking at an example. There are thousands of typefaces, each a separate design and way to represent characters. However, there are exponential fonts, as every typeface can have millions of different way of styling the typefaces. Even different sizes relate to a new font.